"If everybody is not willing to join and contribute equally, we will wait until they are," said the Saudi oil minister. OPEC and its allies are working towards cutting oil output by up to 1.5 million barrels per day but could fail to reach a deal if no compromise is found with non-OPEC Russia, the Saudi energy minister said on Thursday. The Organization of the Petroleum Exporting Countries is meeting Thursday but is also waiting for news from Russian Energy Minister Alexander Novak, who flew back from Vienna earlier for possible talks with President Vladimir Putin. Novak returns to Vienna on Friday for talks between Saudi-led OPEC and its allies. OPEC hopes to prop up the price of crude, which has fallen by almost a third since October, but President Donald Trump has demanded it make oil cheaper by refraining from output cuts. 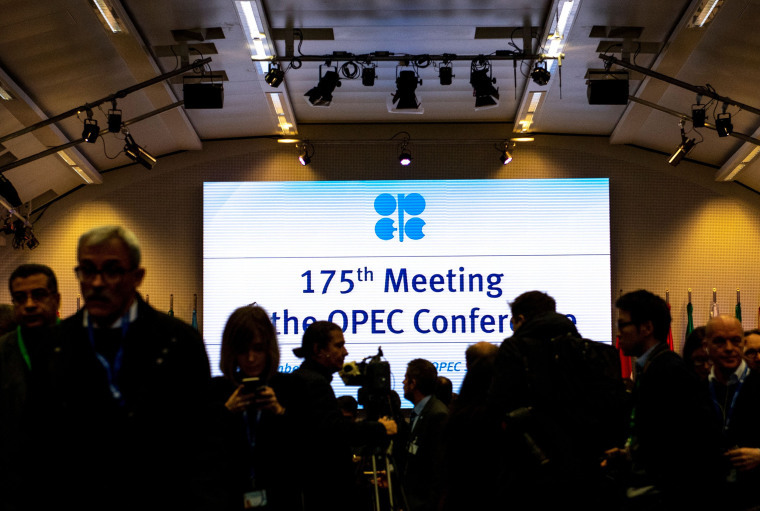 "We hope to conclude something by the end of the day tomorrow ... We have to get the non-OPEC countries on board," the Saudi minister, Khalid al-Falih, told reporters. "If everybody is not willing to join and contribute equally, we will wait until they are." Asked whether OPEC could fail to reach a deal, he said all options were on the table. Possible output cuts by OPEC and its allies ranged from 0.5-1.5 million bpd, and 1 million bpd was acceptable, he said. Brent oil futures fell 3 percent to below $60 per barrel on fears that there could be no deal and as traders and OPEC watchers said a cut of 1 million bpd was below expectations. "We think OPEC will spend some time to choose the words being used. Being too cautious on the words, to please President Trump, runs however the risk of diluting the message," said Olivier Jakob from Petromatrix consultancy. OPEC delegates have said OPEC and its allies could cut output by 1 million barrels per day if Russia contributed 150,000 bpd of that reduction. If Russia contributed around 250,000 bpd, the overall cut could exceed 1.3 million bpd. Oil prices have crashed as Saudi Arabia, Russia and the UAE have raised output since June after Trump called for higher production to compensate for lower exports from Iran, OPEC's third-largest producer. Iranian Oil Minister Bijan Zanganeh said on Thursday he would support a cut as long as Iran didn't need to reduce its own output. Iraqi Oil Minister Thamer Ghadhban said Iraq, as OPEC's second-largest producer, would support and join a cut.